J of IMAB. 2014 Jan-Jun;20(1):459-463; DOI: http://dx.doi.org/10.5272/jimab.2014201.459. Elka N. Radeva , Radosveta I. Vassileva. Department of Conservative dentistry, Faculty of Dental Medicine, Medical University – Sofia, Bulgaria. J of IMAB. 2014 Jan-Jun;20(1):464-468; DOI: http://dx.doi.org/10.5272/jimab.2014201.464. Vladimir E. Panov,1 Assya Krasteva2 , Adriana Z. Krasteva3, Aneta Ivanova4, Anton Panov5, Zahariy Krastev4. 5) Dentist. Private practice, Sofia, Bulgaria. J of IMAB. 2014 Jan-Jun;20(1):469-472; DOI: http://dx.doi.org/10.5272/jimab.2014201.469. Desislava Konstantinova, Hristina Arnautska . J of IMAB. 2014 Jan-Jun;20(1):473-477; DOI: http://dx.doi.org/10.5272/jimab.2014201.473. Hristina Arnautska , Gergana Ivanova. Department of Prosthetic Dental Medicine and Orthodontics, Faculty of Dental Medicine, Medical University - Varna, Bulgaria. J of IMAB. 2014 Jan-Jun;20(1):478-483; DOI: http://dx.doi.org/10.5272/jimab.2014201.478. Department of Oral and Maxillofacial surgery, Faculty of Dental Medicine, Medical University - Sofia, Bulgaria. J of IMAB. 2014 Jan-Jun;20(1):484-486; DOI: http://dx.doi.org/10.5272/jimab.2014201.484. Department of Maxillofacial surgery, Faculty of Dental Medicine, Medical University - Plovdiv, Bulgaria. J of IMAB. 2014 Jan-Jun;20(1):487-489; DOI: http://dx.doi.org/10.5272/jimab.2014201.487. Genoveva Balcheva , Miglena Balcheva. J of IMAB. 2014 Jan-Jun;20(1):490-493; DOI: http://dx.doi.org/10.5272/jimab.2014201.490. Janet Kirilova , Snezhanka Topalova-Pirinska. Department of Conservative Dentistry, Faculty of Dental Medicine, Medical University - Sofia, Bulgaria. J of IMAB. 2014 Jan-Jun;20(1):494-499; DOI: http://dx.doi.org/10.5272/jimab.2014201.494. Emilia Karova , Snezhanka Topalova-Pirinska. J of IMAB. 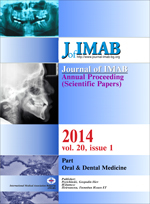 2014 Jan-Jun;20(1):500-503; DOI: http://dx.doi.org/10.5272/jimab.2014201.500. Galia G. Zhegova1 , Maya R. Rashkova1, Bozhidar I. Yordanov2. 1) Department of Pediatric Dentistry, Faculty of Dental Medicine, Medical University- Sofia, Bulgaria. 2) Department of Prosthetic Dentistry, Faculty of Dental Medicine, Medical University- Sofia, Bulgaria. J of IMAB. 2014 Jan-Jun;20(1):504-509; DOI: http://dx.doi.org/10.5272/jimab.2014201.504. J of IMAB. 2014 Jan-Jun;20(1):510-513; DOI: http://dx.doi.org/10.5272/jimab.2014201.510. Kalina Georgieva , Desislava Konstantinova. J of IMAB. 2014 Jan-Jun;20(1):514-516; DOI: http://dx.doi.org/10.5272/jimab.2014201.514. Mirela Marinova-Takorova1 , Radostina Anastasova2, Vladimir E. Panov2, Spartak Yanakiev3. 3) Medical Colledge “Y. Filaretova”, Medical University - Sofia, Bulgaria. J of IMAB. 2014 Jan-Jun;20(1):517-519; DOI: http://dx.doi.org/10.5272/jimab.2014201.517. Radostina Anastasova1, Mirela Marinova-Takorova2 , Vladimir E. Panov1. 2) Department of Conservative Dentistry, Faculty of Dental medicine, Medical University - Sofia, Bulgaria. J of IMAB. 2014 Jan-Jun;20(1):520-525; DOI: http://dx.doi.org/10.5272/jimab.2014201.520. Department of Prosthetic Dental Medicine, Faculty of Dental medicine, Medical University - Sofia, Bulgaria.